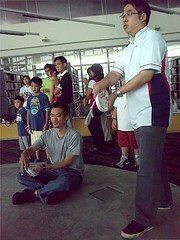 Rambling Librarian :: Incidental Thoughts of a Singapore Liblogarian: Gaming preview session at Jurong Regional Library, Saturday 24 Oct, 2009. 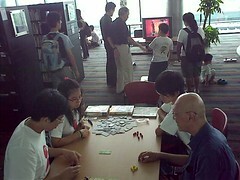 Gaming preview session at Jurong Regional Library, Saturday 24 Oct, 2009. About 20 people responded to the public library's call for participants last Saturday. We had a very good mix of the young to older people. With their help, my colleagues now know what will really work and what other refinements we need to make for the "live" sessions that will be held in the next two months. 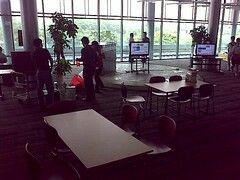 Big thanks to the participants, volunteers (Nicholas, Hero, Alyosius, Cheryl, Sebastian) and staff for enabling the library test out the flow of the session. And a special mention to those who helped spread the word by re-tweeting, forwarding emails, blogging about it. Participants were assigned into groups (one objective of the Gaming session was to have participants interact with new people; it's structured to infuse elements of social interaction, conversations/ discussions, learning. Definitely not the arcade-style play-and-scoot event). 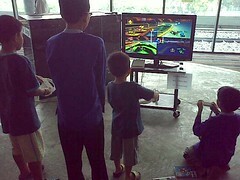 Each group moved around to try out various game stations (a mix of electronic console games and board games). 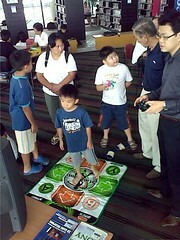 At each station, participants were briefed on how to play. Where relevant, some learning-related information was thrown-in. 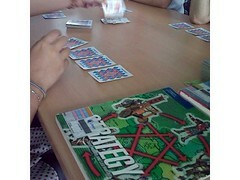 After each play, they moved to the next station as a group (at least that was our intent). 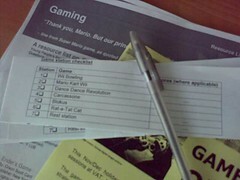 Each participant was given a checklist of stations to cover, and also a resource list of related books and web resources that they would encounter during the session. Learning point: About half did not turn up on time. This posed a problem since our structured session required participants to be assigned to complete groups. My colleagues and I will have to plan for this. We held the session at the Verging All Teens section at JRL because it was the few venues in the public library system that had an open-concept programme zone and was adequately soundproof. 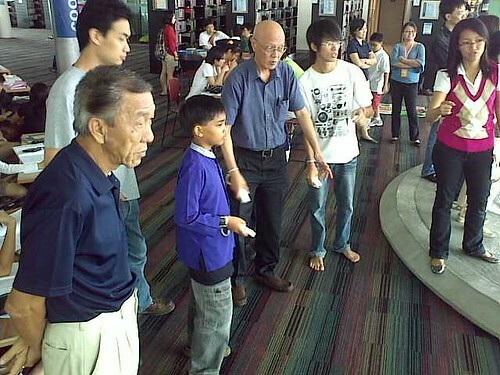 Here's Mr. Yip and his grandkids, trying out Dance Dance Revolution. Well, Mr. Yip didn't try. I think this station got the fewest play. Understandably, participants -- even teens -- tended to be self-conscious when it comes to dancing. The Wii Mario Cart Racing station was quite popular among children and adults. 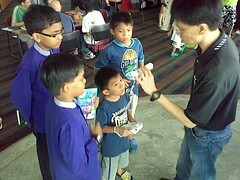 My librarian colleague, Hakim, explaining how the game console works to these four boys. 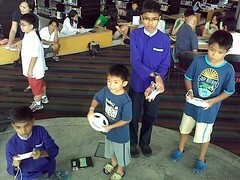 The two Chinese boys were Mr Yip's grandkids while the two older Malay boys were walk-in participants, who'd visited the library to borrow books. They stood there looking interested, so they were invited to play. This was sort of like a rest-and-converse station. My colleague, Aaron (left) asked what the participants thought of the session so far, and also took the chance to explain why the gaming session was planned this way. Mrs Daisy Yip (second from left), a grandmother and educator, mentioned something quite interesting. She shared that at the board game stations, total strangers felt comfortable enough to engage in discussions and conversations. This photo (which wasn't posed, btw) summed up one objective of the gaming session idea: a shared activity that encouraged natural interactions among participants, regardless ages, gender, race, and gender. 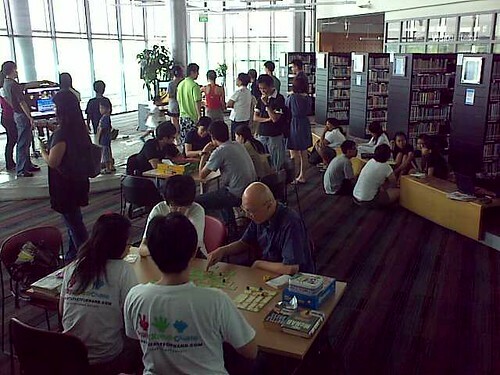 My friend and gaming-in-library advocate, Kevin Lim, dropped by and interviewed Aaron on why the library organised the event. 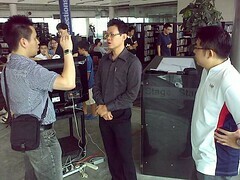 On the right was Nicholas Khoo, from the Cybersports & Online Gaming Association. The session ended about two and a half hours later. It overran by 30minutes, partly because we started late. 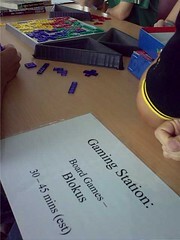 All in all, two hours was a good duration for a total of four gaming stations (console and board games) for 15 to 20 participants. 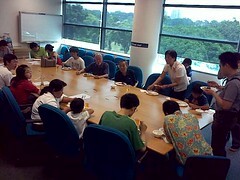 Just for the gaming preview, the volunteers adjourned to the library's meeting room to have lunch. They filled out the survey form, gave us an overall thumbs-up. One or two honestly told us about their skepticism of the use of a gaming session, and that was fine. 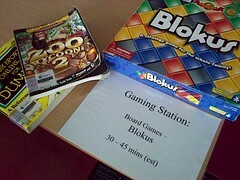 Many libraries, particularly in North America, have already implemented Gaming. The concept is not new and I don't know of any librarians who oppose the concept. What I think we have to do is to make our learning intents clearer before/ during the sessions. What needed to be refined was the learning facilitation aspect. On the part of the librarians facilitating the session, the emphasis seemed to be on giving instructions on how to play the game. What I think we should create are stronger links of the learning relevance of the games. 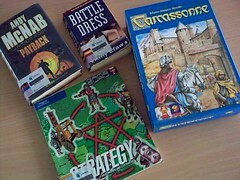 The book displays and gaming-related resource lists, by themselves, were not adequate. For the "live" sessions, we're considering pre/ post-game quizzes, scripts for facilitators on information about the context of the games from relevant information sources. Also, a quick round-up of thoughts/ comments before participants move to next station. What we certainly do not want is to turn the library into a games arcade. I believe the difference between a games arcade and a Gaming Learning Community, facilitated by the library, would depend on the librarians as facilitators: how information and structure of activity is contexualised for participants. Like in a tour group, a great tour guide doesn't just tell the group where to walk (tourists can do this by themselves with basic instructions). The tour guide would also explain the significance of the walk. 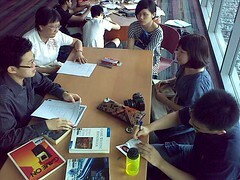 The public library will hold 10 sessions, open to public, in Nov and Dec '09. 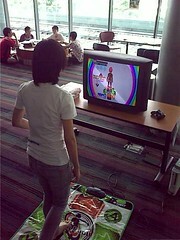 Interested participants can register at golibrary.nlb.gov.sg (search for "gaming" here). As for whether this will become a regular event after Dec '09, we'll do an evaluation before deciding. And as always, public feedback would help in our evaluation. Way to go, Ivan. Thank you and your energetic and creative team of co-workers and volunteers for all the splendid efforts to organise the event. 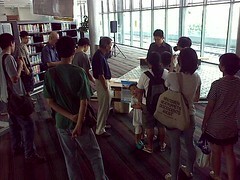 Library visitors, young and old, will soon be able to visit the "edutainment libraries". Pls provide a special bookshelf section near the gaming areas to encourage gamers to read books about the games they play. Nice to have you test the session for us. And for connecting me with uncle Dicko and family. I like the "Read and Play" idea. Giving serious thought to this. Thanks! 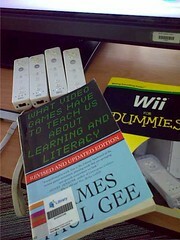 Extremely Interesting, Gaming is not something usually associated with the library. Excellent for you!